This is the 4th cask i’ve been involved in the bottling of (details of the other 3 can be found HERE ) , This one was bought via Raymond Armstrong while he was at Bladnoch and was sold to shareholders who frequented the Bladnoch Forum . 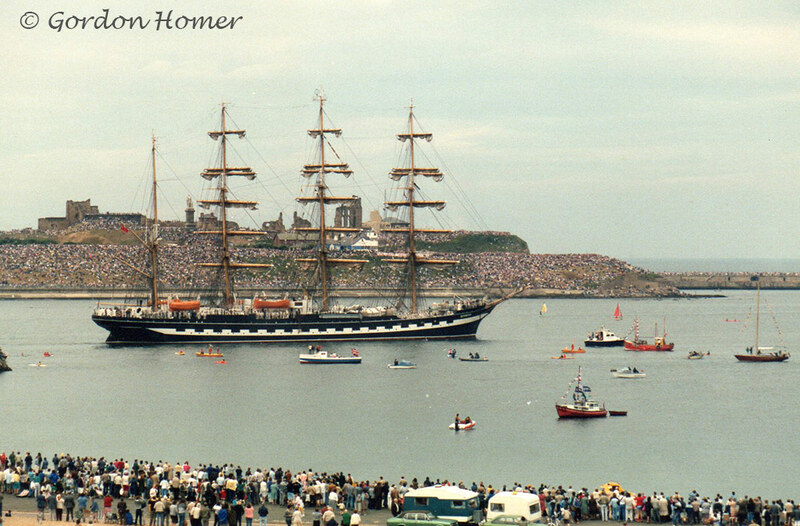 Some of us knew each other which would turn out to be a bonus the way future events unfolded……. 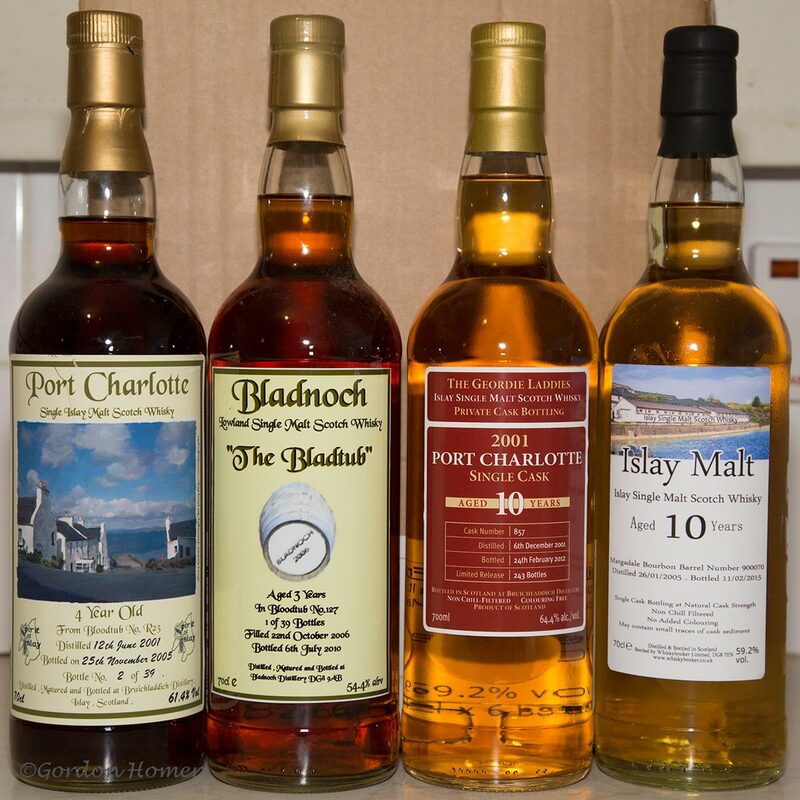 Basically with just under a year of the 10 year maturation left the company that owned Bladnoch was taken into Voluntary Liquidation , We all thought that the Distillery would have been sold by the time we bottled but it wasn’t ! So after talking with the Shareholder i knew we decided to track down the remaining members with the help of the Worldwide Internet and Raymonds new Forum . Eventually on the 11th February 2015 we got the cask released to Martin (Raymond’s son) for his company , Whiskybroker.co.uk , to bottle….. later that same day ! 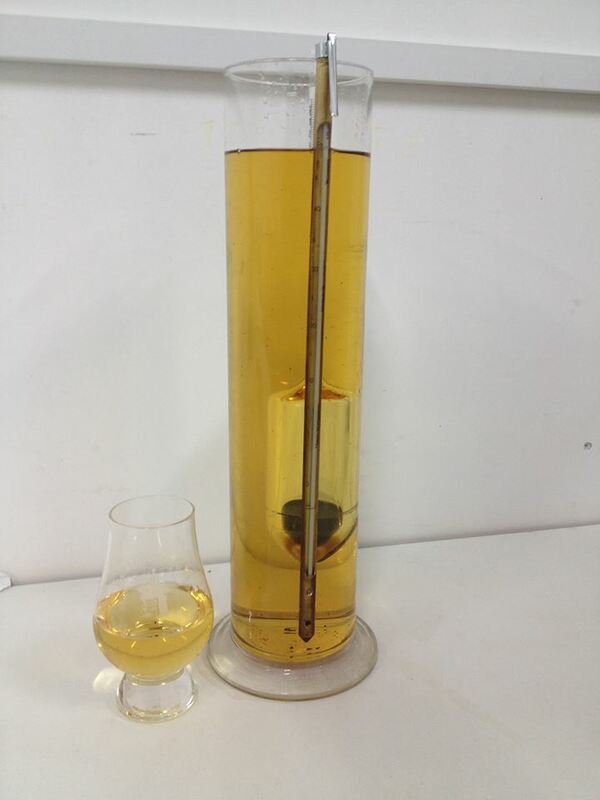 The Margadale is the peated spirit distilled by Bunnahabhain and called Moine by the Company , the peating level is believed to be 38 ppm (just a smidge below Lagavulin’s and Caol Ila’s level ) but Bunnahabhain has been known to peat at a lower level . The Margadale was distilled on the 26th January 2005 during John Maclellan’s management , filled into an ex-Bourbon Barrel – by the outturn of 243 bottles it may have been a fresh one or very tight 2nd refill – it came out at 59.2% ABV . And now the nitty-gritty bit….. How does it taste ? Pale straw in colour . It is incredibly smoky on the nose , and i mean SMOKY ! Very seashore , the proverbial ‘Bonfire on the beach’ , It has a slight sweetness to the nose and a creaminess , very reminiscent of a South Shore Islay starting with ‘A’ , then a damp peatiness . A very fiery palate , lots of white pepper , a fierce peatiness along with smoke , there’s a hint of the Bunnahabhain sweetness but not much , a touch of barley and there is a slight chewiness to it . The finish long , peppery hot and peaty . It can take quite a bit of water which enhances the creaminess and the seashore qualities and doesn’t affect the smoke . The empty glass smells wonderful even after only a few minutes . And then there were 4……..
Back in Ye Olde Days When i was a member of the SMWS , The days when the Malts were good value , usually unsulphured and Annabel Meikle (@thewhiskybelle) was pouring , the odd Friday night was spent in some lovely spot in Newcastle sampling 5 Cask Strength drams , there was usually a small feast of cheese and biccys at some point in the night . 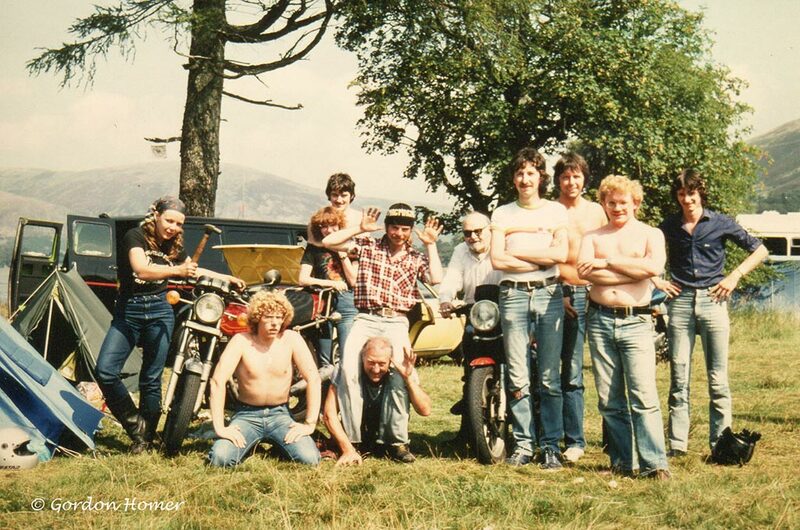 Let’s recreate them fine evenings with 5 old drams from the Society in it’s hey day……. without the cheese ! The evening usually started with a Classic , quite often a well aged Glenfarclas so lets go with 1.101 , a 25yo from May 1997 at 52.1% and labelled as ‘ Apricots and Thinners’ . A Lovely Golden Syrup colour , the nose is quite fruity with a touch of solvent in my eyes rather than thinners but not much , yup Apricot Jam , there’s also Battenburg Cake , ripe Bananas and Strawberry Jam . Getting Almonds so that’s maybe where the Battenburg came from and a bakewell tartish smell . The palate is quite feisty so maybe it was a not very active Bourbon Hoggie , again fruity with a smidge of Vanilla and opal fruits . The finish is medium , sweet and very chewy ! Not a bad way to start the evening…..
2nd dram is a one from the Good ol’ SMWSA , 37.33 , had to look this one up as i couldn’t remember what it is , a Cragganmore apparently, a 14yo from March 1993 at 60.9% . It’s sherried….. a nice ruby red colour , lots of Christmas cake on the nose , cola cubes but none of the ‘S’ word , Woo-Hoo ! The palate is huge on the sherry , very dry (Oloroso?) and lots of the christmas cake again , the finish is deliciously long , ooh dark chocolate cherry liqueurs ! Wow ! Hang on….. all my old American friends always used to say they used t send the crap over to the states , Maybe my definition of crap is different to theirs ? A wonderful dram ! The Middle Dram ! 99.11 , a 29yo Glenugie at 43.4% , no year unfortunately as the society had changed the labels by this time and thought it would be better to put notes on rather than bottling details but it does say ‘monstera deliciosa’ , whatever that means……. Very pale for a 29yo , Ripe Straw , My nose doesn’t get any of the notes on the label tasting notes (nothing new there…..) , slight nail varnish remover , artificial fruit smells (like in sweets) , old library books and leather . The palate is very lemon flavoured throat sweets , that medicinal bitter type , not very pleasant to me , the finish is basically the same , not the best , i seem to remember this was a disappointment at the time of purchase but in a SMWS tasting you rarely got 5 drams you really liked….. In all my SMWS tastings when i was a member i cannot remember there ever being a Grain on a tasting (i can remember there being a Brora !) , I’ve tried a few SMWS Grains and on the whole they’ve been good , my tasting notes for a SMWS North British made it into the Distillery internal Book released every 25 years courtesy of Mr Robin Laing ) . So the Penultimate dram of this tasting is a Cambus , G8.1 , 21yo at 61.2% ‘Light , Bright and Agreeable’ . Doesn’t smell 60%+ , digestive biscuits , honey , fresh grain and vanilla . The palate is Highland Toffee (the one with the Coo on ) , honey and digestives , very sweet but thoroughly enjoyable ! The finish is long and sweet . A cracking dram , should have had more on the actual tastings….. So to the final dram of the tasting , bit of a story to this one , this is from one of the first tastings i went to , it was served to me by the aforementioned Annabel in the Trinity House Museum and it was the dram that started a love affair with the distillery , i’d only ever tried the Flora and Fauna 15yo and wasn’t impressed , so when i tried this one it was Wham , bam , thank you mam ! Also all the SMWS tastings traditionally finished with an Islay , for obvious reasons….. So onto 53.50 , a 7yo Caol Ila from October 1993 bottled at 62.1% . Very light Chardonnay Wine in colour , very powerful Medicinal initially on the nose , ok totally on the nose ! Antiseptic , eh….. Antiseptic , wonderful Antiseptic ! The palate is pretty much….. Medicinal , maybe a touch of seashore , seaweed , iodine but with a wonderful , long , warming , medicinal finish , actually got a waft of smoke right at the end . 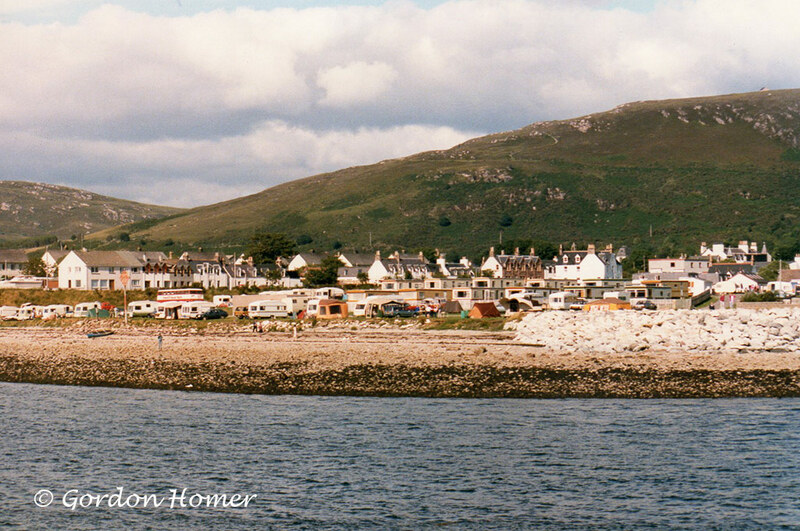 If you don’t like Islays this ain’t for you ! Still as wonderful as that first day !!!!! A Wiser Man Than Me Once Said…..
I’ve got what I think is an American bottling of this , it has “Imported” on the label and was bought at a UK retailer who I’ve heard gets his Canadian stock from the USA . So now to find out if it’s different from the one here http://thewhiskyodyssey.net/2014/08/22/4-more-canadian-whiskies/ . Virtually the same colour , the nose is more pronounced than the Imported one , there’s definitely more Rye there along with dried fruits and Vanilla . There is also a different profile to the palate , the imported is more ‘relaxed’ , there seems a bit more of a kick to this one (as much as a kick there can be for 40%….) , more spices and Butterscotch along with vanilla . The finish is quite long with rye , corn and spices . Not a bad dram , a decent enough session whisky . The Red Letter is aged for at least 10 years in American bourbon barrels and is then further mellowed by finishing in virgin white oak casks . The first thing that hit me on the nose was vanilla and Oak , then the finest highland toffee (the one with the Coo on….) , there’s Confectioners sugar (like in Bunnahabhains finest ) and a hint of citrus oil . This is one of them noses you could sniff all night , great stuff ! Everytime you revisit it you pick up something else…… Best move on to the palate , Spicy toffee with oak , the virgin wood is noticeable here but adds to the whisky with a slight bitterness and doesn’t detract from it , the Rye is evident on the palate mixing in well with the spices and there’s a slight hint of bitter chocolate . The finish is medium , hot and spicy rye . What a dram , the virgin oak gives it a beautiful twist , definitely one to put on the “to buy” list ! Very closed nose , not a lot coming through , rye , saw dust , hint of Butterscotch . Can’t say the same about the palate , an absolute delight , Butterscotch rye and the saw dust again , spices and pepper , delicious ! The finish is long , peppery , sweet and has a nice woodiness to it . This is another cracking dram , the first 18yo I tried from Canada was the Gibson’s , this is on par with it but with an extra kick ! Made from a select blend of Canadian Rye , Rye Malt and Barley Malt , the nose on this is fantastic , Apple Pie , Cinnamon and Custard , Rye Bread , Cloves and oak . The palate start off as finest Stewed apples then rye before moving on to fresh cut saw dust , finally there’s a pot pouri of spices . The finish is long , warming and wood spices . What a cracking dram , one to add to the list of possible purchases ! So what have i learned from this huge (for me) whisky tasting ? Well there’s a great variety of Whiskies from our friends across the pond (and slightly to the right from where i’m sitting….) , all of it is drinkable , Most of it is outstanding , i’ve discovered a love of Rye from our Commonwealth Brothers through this and previous Canadian tastings . I’ve also discovered i could serious break the bank and the Baggage allowance on our next trip over but i think i’ve narrowed it down….. a bit….. What’s the duty again when you come back into the UK ? 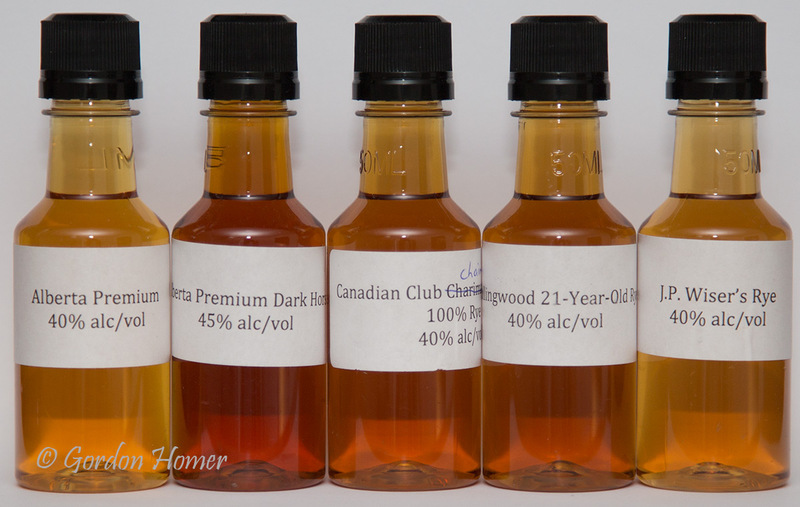 A Good list to start off with…… But which is my Favourite of these 2014 Canadian Whiskies ? Nose wise it’s just the Wiser’s Legacy just over the Lot No.40 and J.P. Wiser’s Red Letter ! Palate Wise it’s the J.P. Wiser’s Red Letter just over the Caribou Crossing! So It’s the Red Letter ! It just has that certain something about it that makes it stand out . A final big thank you to Davin de Kergommeaux for giving me the chance to try these wonderful Canadian Whiskies and for putting together a great resource site at CanadianWhisky.Org , Cheers Davin ! 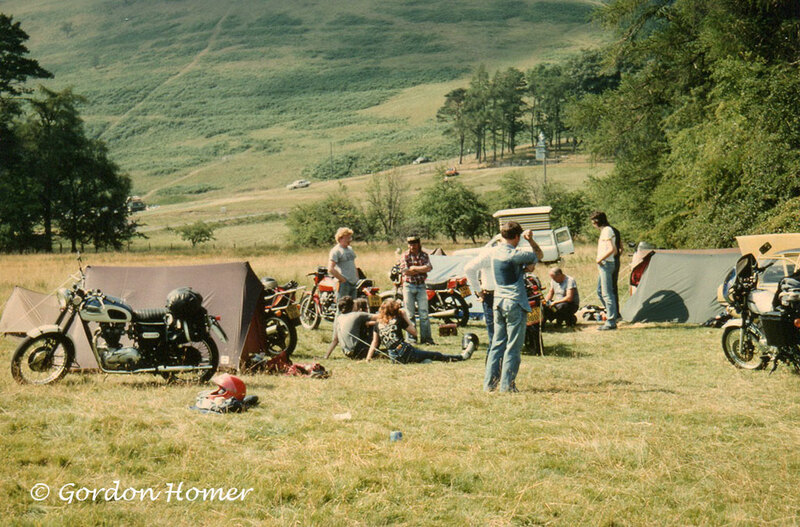 After the excitement of the first Camping trip to Scotland we returned a few weeks later to participate in the Longbenton DHSS Motorcycle Clubs weekend trip to St Marys Loch in the great area of Roxburgh , Selkirk and Peebles ! This was a great Campsite in the field between the Tibbie Shiels Inn and the Loch , they did stop camping there at one point due to ‘troubles’ (not us i hasten to add ) but later on they did start it again in a smaller way for walkers , in the Inns Garden , because Myself and the Gorgeous Melanie actually stayed there in the 90’s on one of our numerous camping trips to Bonnie Scotland . The Aftermath of Tea ! Much Merriment was had , including a ride to Peebles where we encountered a car rally coming the ‘Other’ way along the narrow roads ! 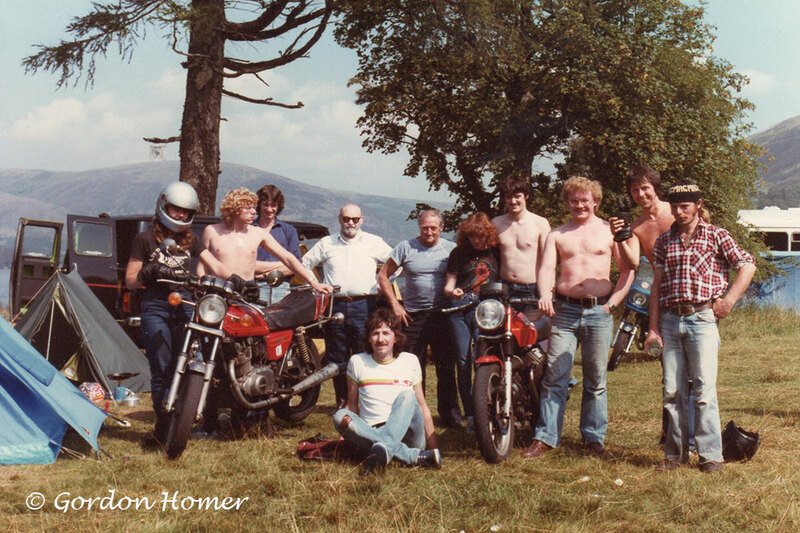 Even though i had a bike at that time (a Honda Twin 125 due to been a learner) i didn’t take it up there , i did however get to have a (slightly illegal) go of a Moto Guzzi 500 with no Front breaks and a dodgy speedo and to ride on the back of a Classic Triumph 650 Bonnie , possible the best Bike i’ve ever been on . 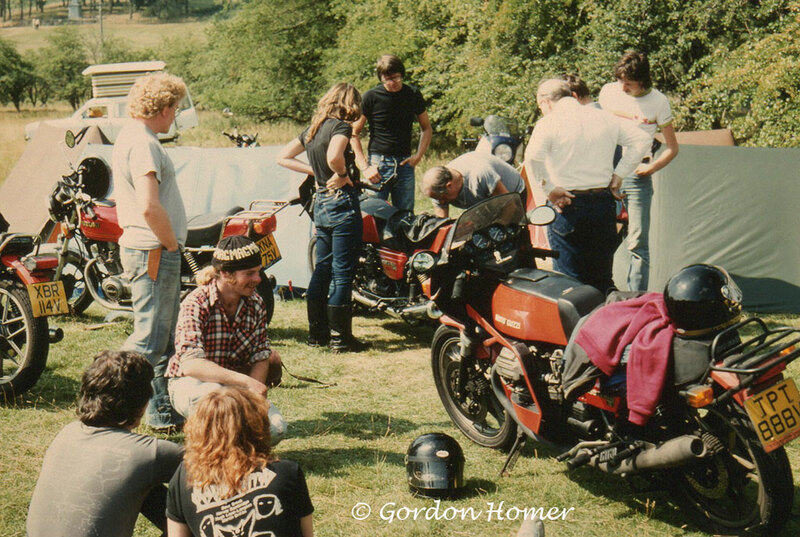 The General Mayhem with the Bonnie to the left…. The aforementioned Moto Guzzi ! Now in 1984 having got the taste for the Uisge Beathe it was actually quite hard to buy the stuff in the Toon (That’s Newcastle to you) , Aye you could pick up the Blends in all the Offies (Off- Licenses) but Single Malts ? you had to go to the Department store in the City , Fenwicks , they had a cracking “Wine Department” that sold some of Scotlands finest that was available at the time . Macallan 10yo was a regular purchase and shortly after a strange brew called La- froy-ageeee soon followed it . Now no matter what anyone says , 1980’s 10yo Laphroaig was a different kettle of fish to what it became in the noughties , quite often at parties in the Bedsit i frequented in late 1984 / early1985 cries of “WTF is that smell !” were heard and if friends dared to taste it….. their faces were always a picture ! Not much experimentation happened in this period , probably due to a lack of expressions but personally i blame Thatcher….. 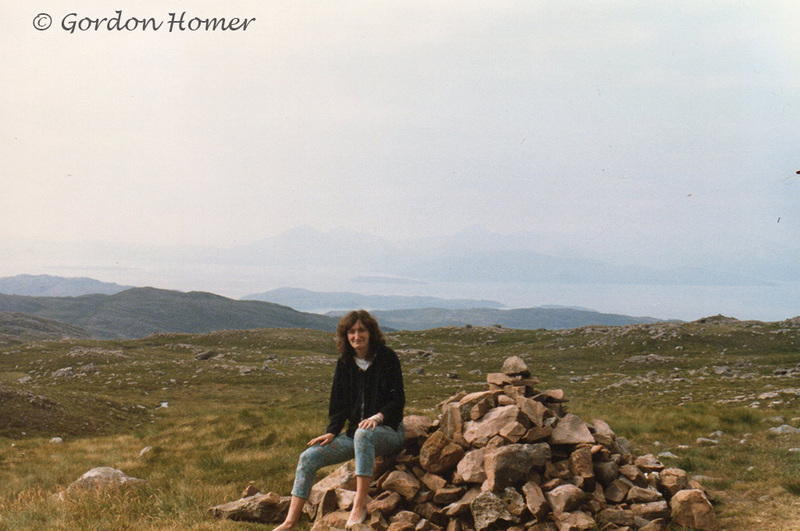 Myself and Dave did head back for another tour of the Highlands in 1986 along with my then Girlfriend Liz and a mate Peter . We pretty much covered the same places but one of the highlights was staying in Uig on Skye , Great campsite which was sadly gone on our last visit there , within easy staggering distance of the pub , we had a great night there , somehow we were the only people that knew all words to ‘My Old Mans a Dustman’ in the place and the singer managed to guess that we were from Newcastle ( Nowt to do with all the Empty Broon Ale Bottles on the table…..) . 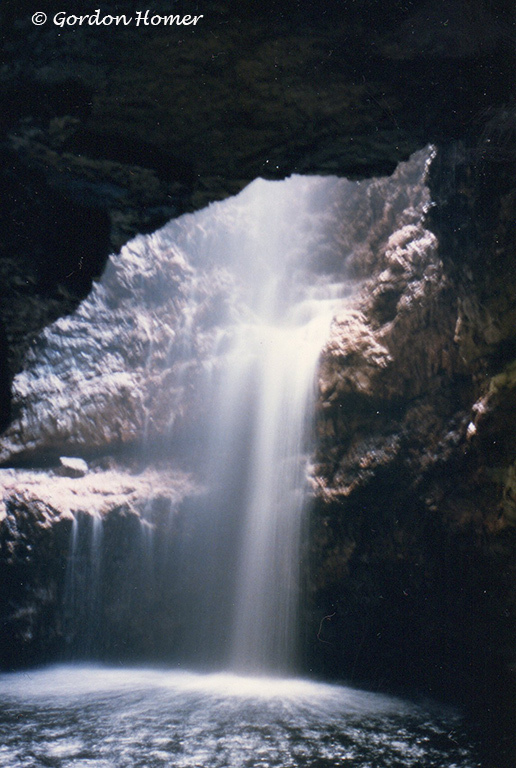 One highlight was a trip into Smoo Caves , a guide actually took us in a dinghy further into the caverns . 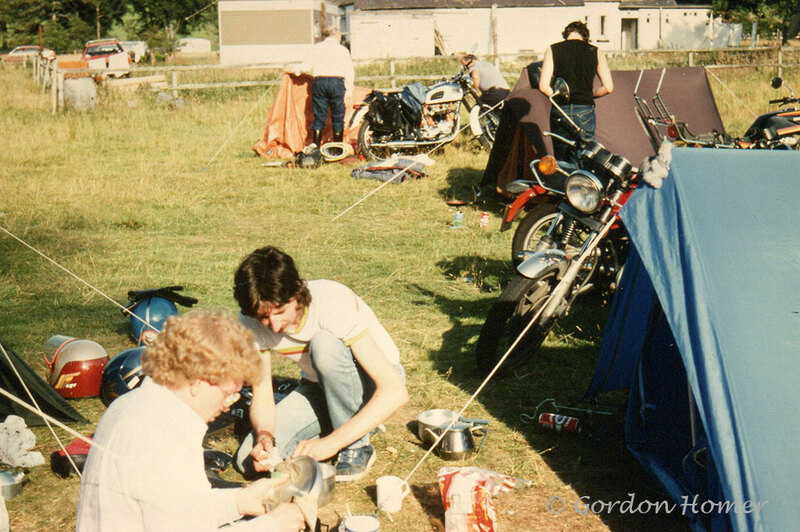 The 80’s basically just chugged along , went to The Mayfair , went to see concerts – The highlight of which was favourites of mine , Aerosmith , actually touring the UK , have to say them drifting into ‘Seasons of Wither’ at the City Hall was the highlight of the 3 concerts i went to on that tour – going to the local beers festivals and buying the occasional bottle of malt from Fenwicks , oh and there were a couple of Tall Ships races . But things were going to change for ever soon….. I remember going into Tescos (and this will shock some people ) and buying a bottle of Springbank (you what!) 18 or 21yo for a ridiculous price (can’t remember which one but £35 seems to ring a bell ) mind you it was rightly cheap as it was in a pretty garish red and silver box . That was the only bottle of whisky i ever had something peculiar happen to , Little flakes of silvery white stuff appeared in it . Oddbins had a greater selection and with the assistance of the well trained and helpful staff they had at that time ( This was before Eddie Ludlow became a member of staff there !) i was trying all kinds of weird and wonderful stuff . Things were really going to get better in the Nineties ! A Soupçon of Wafer Thin Mint ? A mixed bag of Canadians in this flight , onward and upward….. This is a 100% Rye whisky made from unmalted rye , produced by Alberta Distillers Ltd, of Calgary, Alberta. A lovely rye nose , vanilla , a touch of spice and orange . The nose is actually quite subtle but thoroughly enjoyable . Ooh….. excellent palate , bags of dusty rye , spices , a bit of oak and orange . A medium finish loaded with spices (especially cloves) and barley sugar . A lovely little dram , may need to go a bottle of this ! I have tried a few of the Alberta Premiums and “other” ryes that came from the same company and I have to say I really like them and rate them highly . Dark Horse contains 12yo Rye whisky and 6yo small pot rye , it also, according to Davin, has a ‘Dollop’ of well aged corn whisky and a ‘smidgen’ of sherry, What , no Wafer thin Mint ? 😉 it is aged in heavily charred American barrels . It’s very dark , almost like an oloroso aged whisky . The nose is a mixture of sherry and rye , it’s the proverbial Christmas cake – Dried fruits , citric peel , glace cherries , cake dough – at first then dusty rye with a soupçon (it’s catching….) of butterscotch . The rye comes through on the palate , not as strong as previous Alberta Premiums I’ve had , I think the sherry and charring seems to dull it , luckily there is a long finish which seems to bring out the rye , butterscotch sweetness and wood spices . An unusual Rye , different , great nose , slightly under-whelming palate and a good finish . Worth a try but not a bottle in my opinion . Lovely fresh rye nose , really dusty , loads of butterscotch , absolutely wonderful nose and the palate doesn’t disappoint ! Again rye and butterscotch but with a nice smattering of spices . On the finish there’s a very strong hint of Lemon . Heard good reports about this one and it doesn’t disappoint . This is the 2nd time I’ve had a sample of the Collingwood 21yo , the first time I wrote “I was looking so forward to trying this , Davin recommended it on my visit to Toronto and I couldn’t find it , it’s actually a bit of an anti-climax….” So will my opinion change ? The rye seems a bit more lively on this sample , again it has the fresh bread smell also quite meadowy , touch of vanilla as well . On the palate it’s very spicy , the rye’s more prominent , the Barley sugar sweetness is there like the original sample . The Finish is medium , peppery , vanilla and a slight bitterness . 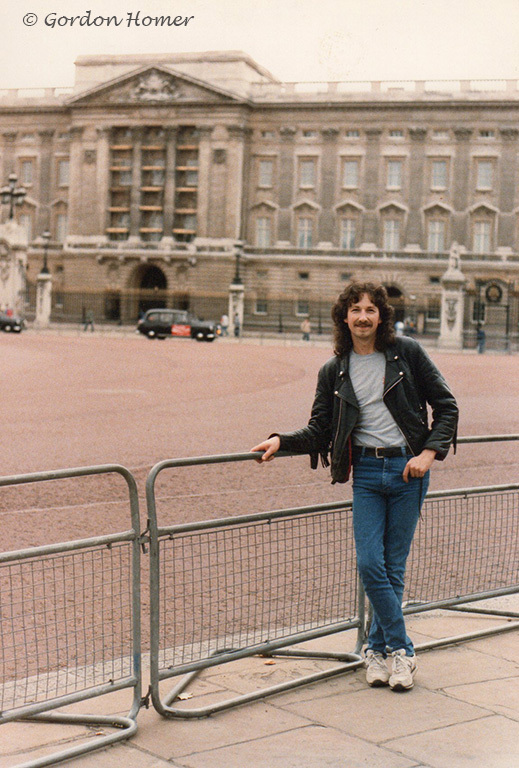 The Jury is still out on this one with me though it is better than what I remembered from the last time…. Trying to work out whether this is a 100% Rye or just has a high proportion of rye in it , it has an incredible rye nose , hot buttered rye toast ! Not really a lot else there to be honest . The palate is very smooth , butterscotch toffee with a touch of pepper . The finish is medium and is quite sweetish / toffee . I gather this is one of Wiser’s base whiskies (as in lower cost) , it’s a pleasant enough dram but nothing to write home about . Thanks again to ‘Mr Canadian Whisky’ Davin for the Samples. Born in the US…… eh Canada ! A whole bunch from the Sazerac company from the US of A ! This is the entry point to Sazeracs range of Premium and Ultra-Premium Canadian Whiskies , This seems to be heavy on the corn going off the initial nose , very buttery and digestive biscuits . There is a touch of rye but it’s just getting through dried fruits , saw dust and a distinct earthiness . A very distinct caramel toffee taste at the start of the palate , very sweet , spices especially cloves and there is a touch of bitterness which eventually gives away to the Butterscotch sweetness . The finish is long , butterscotch , spices and pepper . Not a bad whisky for the entry point bottling , nice palate and finish , think it is better than the Legacy but not a patch on the Caribou Crossing . From an undisclosed Canadian distillery , this is bottled at the Buffalo Trace Distillery in Frankfort , Kentucky . This has a bit of a strange nose , very fruity including ripe banana , a touch of rye , vanilla , the one thing I keep coming back to is the smell similar to bourbon from well charred casks . The palate has the more familiar Rye bread , Butterscotch sweetness , vanilla , pepper and spices , it has a lovely oily mouthfeel , silky smooth , delicious ! The finish is medium with loads of spicy sweetness . The Nose is very Un-Canadian , more bourbonish but the taste is cracking . Not a bad wee dram ! Although the brand is now owned by Sazerac , it was originally owned by Gooderham and Worts , The Whisky is distilled , matured and blended in Canada it is again bottled in Frankfort , Kentucky . This whisky has a wonderful nose , oak spices , rye , creamy toffee and baking Christmas cake , joyful ! The palate has a wonderful oiliness to it , Bags of butterscotch , spices , pepper and a very big hint of buttery digestives . The finish is medium long , sweet and spicy . This is probably the best of the three so far , well balanced and a delightful dram . 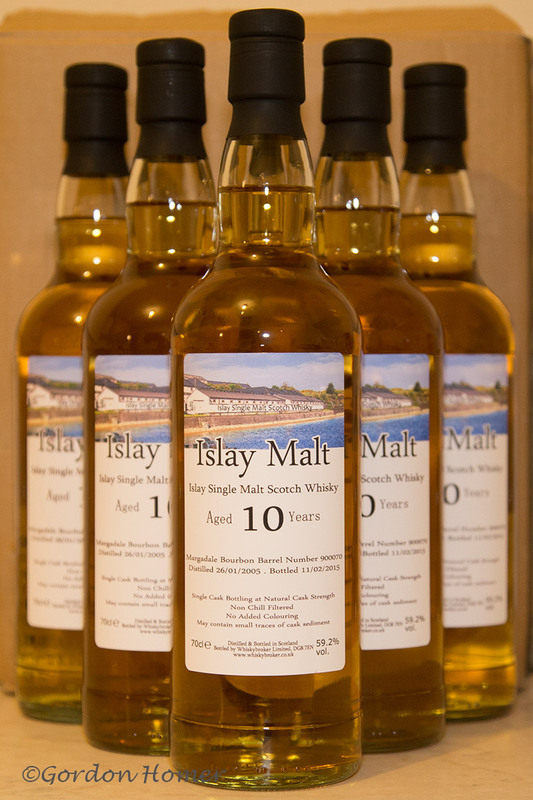 What a wonderful nose this one has , Incredible Rye , Spices , bags of vanilla and butterscotch toffee…… Drool! Interesting Palate as well , pretty much all of the above with a twist of lemon thrown in , nice creaminess across the palate , fairly long finish , quite oaky . This is definitely one on the list for possible purchase on our next visit . 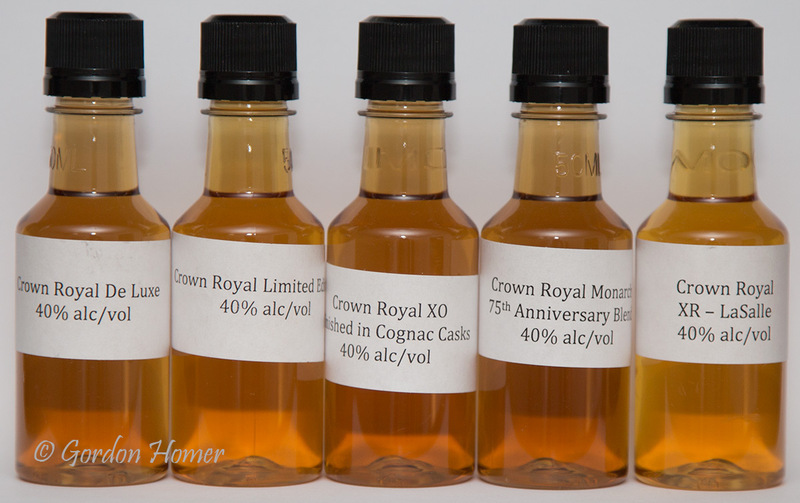 The Royal Family Canadian Whisky Vertical, My …. ! Continuing with the Canadian [Whisky] Odyssey , this time with the offerings from the Diageo family . Created in 1939 to celebrate the visit of the King George VI and Queen Elizabeth to Canada , it is made up of a blend of Fifty distinct , full bodied whiskies (Corn , Rye and Malted Barley) matured in white oak barrels , it is Canada’s number 1 selling whisky . It has a pretty clean nose , almost bourbony , not much rye , there does seem to be a lot of corn whisky notes , there is also a very small spirity note . The palate is again very clean , loads of vanilla (fresh casks ?) , very little spices up to now but the rye has reared it’s head . The finish is medium long with rye , cloves and wood spices . A pleasant enough dram , nothing special to write home about , reminds me more of a Bourbon Whiskey than a Canadian . Crown Royal is now part of the Diageo portfolio , This one is released in Canada only . A bit more of a different nose to the De Luxe , definitely more Rye , hint of green fruits – apples , pears , the butterscotch sweetness and a touch of spices . The palate is loaded with rye and spices , quite peppery and creamy , seems to have a bit more bite than the De Luxe . A Long finish with a spicy pepperiness . The LE is definitely more enjoyable than the De Luxe , seems to be more of an elegant dram and a one not to smoother in a mixer . Initial nose of Red/Dark fruits , then dusty rye , seems to be a slight lack of creaminess I got in the last sample . Let’s try the palate…. That’s better , just as I got in the past – a bit of dusty rye , butterscotch , spicy , pepper , tarte apples but all wrapped up in a lovely creaminess , A medium to short finish with rye and the cognac . The nose seems a bit closed on this sample but the rest of it is thoroughly enjoyable . Yet another Crown Royal I’ve previously visited , bottled for the 75th Anniversary of the launch of Crown Royal , This wasn’t one of my favourites amongst the batch I tasted it with , the nose has a hint of red apples , slight dusty rye and a touch of Creaminess . The palate is very dry with a hint of rye and not much else . Now I don’t know if it’s because I’ve experienced a few more Canadian Whiskies since I first tried this one but I would prefer a dram of the Deluxe or LE over this as it seems bland . Now if I’ve got this story right , this release is made from Whisky that was distilled at a now closed distillery at LaSalle hence the XR – Extra Rare . Initially on the nose this doesn’t smell like a Canadian , there’s a touch of smoky bacon (!?!?) , then the rye slightly appears , there’s almost an Ardbegish smell to this , Creamy Coffee , fudge , a waft of smoke , lemon citrus , if the peat was there I’d say this was a South Shore Islay ! There’s also a hint of fruit (yes it’s starting to head in the original Kildalton style direction….) , wonderful nose . The Palate is a slight let down at first after the excitement of the nose . Slight creaminess , spicy pepperiness , a touch of wood but after a few sips the palate explodes into life with what you’d expect from a good ‘Rye’ . The finish is medium with a nice spicy warmness . Must say this is one of the better Crown Royals , wasn’t what I was expecting but bloody good !